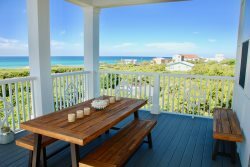 This GULF FRONT CONDO is located next to Rosemary Beach and close to everything that 30A has to offer. This wonderful gulf front condo is truly a gem! It is located between Rosemary Beach and Alys Beach. “Beach Treat” is only a 2 minute walk or a bike ride to the shops and restaurants of Rosemary Beach and a five minute drive to the ever popular Seaside. It is within walking distance to Alys Beach as well. Come enjoy the magnificent sunsets and panoramic views of the sparkling emerald green waters from the setting of this lovely beach condo. Its location in the gated community of High Pointe Beach Resort is on one of the highest points in the Florida panhandle. The condominium community has tennis courts, a large playground for children, a beachside grill, beach chair service, and a large lagoon-style swimming pool with a waterfall, lush landscaping, and a hot tub. Small children will enjoy their own separate shallow pool. Kids and adults will love the easy beach access from this ground floor location. “Beach Treat” is a beautiful, spacious condo located in the perfect spot for a perfect vacation. The 3 bedroom, 3 bath unit has a master bedroom with a king sized bed and a private bathroom with double vanities and a garden tub. The second bedroom sleeps 3 with a queen sized bed and a day bed. It has an attached private bathroom with double vanities. Twin beds are located in the third bedroom, and this room has a full bathroom, which also connects to the hall. A queen sized sleeper is located in the living area. TVs are in each bedroom as well as the living area. The living, dining, and kitchen areas are all spacious and have AMAZING gulf views from inside the condo as well as the patio. A utility closet contains a full sized washer and dryer. A large dining room table will accommodate your family, and there is an extra game table for puzzles and cards. The kitchen is fully supplied with everything for cooking and serving, and it has recently been updated with new appliances. The main living areas have a new color scheme and beautiful new molding. Your family will have a fabulous vacation in this gulf front condo with its magnificent gulf views, ground floor location, and position on a green, grassy hill overlooking the gulf. It is sure to become your favorite vacation spot! Ill see you again next year, as usual ! Very good with communication, emails, clear directions, and no surprises. It was a wonderful week! Very relaxing and enjoyable, thanks to the property, the location, and the ease of renting. Your team members were extremely courteous, knowledgeable, and helpful. They were always right on top of everything, and provided very clear and detailed communications. We had the time of our lives. The condo was gorgeous, huge, and very clean. It was perfectly located. And the community was full of amenities. We loved Crabby Steve's. We will definitely be back. Kimi was responsive, friendly and had a great communication style. Great family friendly, beautiful condo. We would definitely stay here again!